Huh you say..that’s what I said too. Audio and Video failing between federated partners. This only happens when the B-Party user was internal. I also found that when the B-Party called the A-Party the media worked. Following the call setup using Snooper I can see the initial INVITE from the A-Party with 8 possible candidates. Next we see the response from the B-Party in a 183 Session Progress message. The B-Party offers 5 possible candidates. We should now see a message containing “a=remote-candidates” to identify the selected and tested candidate pairs. 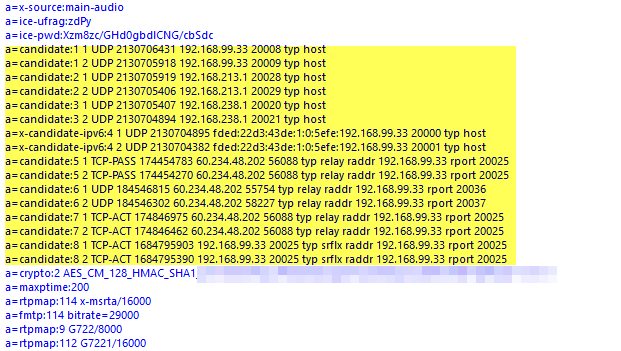 I did notice the reference to LocalLocation=”2″; RemoteLocation=”2″; Having compared this to a successful federated audio call I cant say that this has any relevance since the same location ID’s were present. Generally when the candidate negotiation fails we are facing a path issue. Be that blocked ports or routing. This time, however, the underlying cause of failed candidate negotiation was something I hadn’t encountered (yet). My edge server was configured with external facing IP’s in the DMZ with NATted Public IP’s for each. Checking the NAT using whatsmyIP I discovered that the result was not what I expected. Cycling through all 3 IP’s on the Edge server I found that the routing was not symmetric! Arrghh! Such a simple issue! Asymmetric verses Symmetric simply refers to the paths that data takes on a round trip. 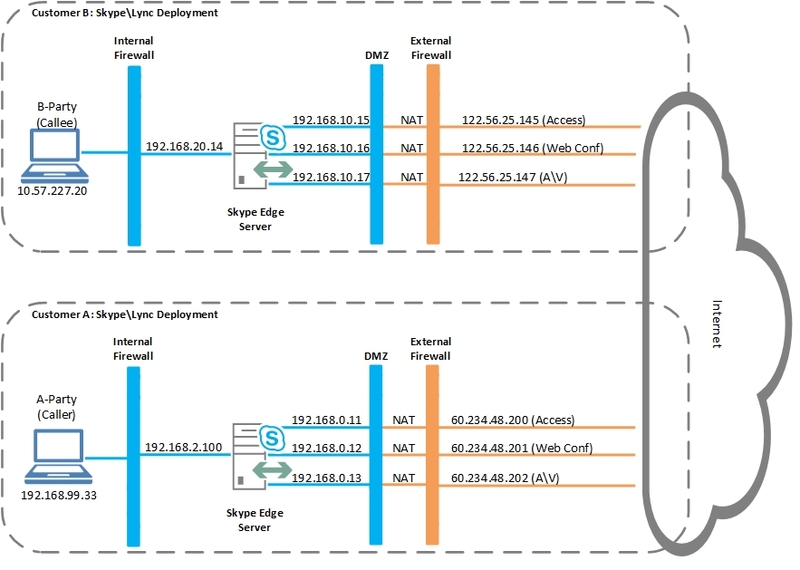 Symmetric routing – Send and receive traffic via the same Public IP. Once the routing was corrected to symmetric the audio was successful. This time the nominated candidate pair for Audio and video was present. Looking into the final INVITE from the Callee (B-Party) to the Caller (A-Party). The Callee is stating that it will use candidate pair 3 to get to the Caller and that it plans to do so via the remote-candidate. Now the Caller states that it will use candidate pair 6 to get to the caller and that this will be done via its remote-candidate. It seems to me that when the candidate negotiation fails the default assumption is that the endpoints must be internal. I can understand that reasoning since you would only expect to negotiate candidates so that you are able to traverse the Edge infrastructure. However, it can lead you down the wrong path. Hi there – Great article. I’ve been wresting with some thing similar. Just wondering how you were able to check the nat of the external facing IP’s in the DMZ on at a time? How did you get the traffic sourced from each of the IPs one at a time. My server is 2008 R2 and there are no options to run ping/tracerts from a specific source address? In my case I was using a single interface with the 3 external facing IP’s assigned to it. So I simply removed the IP’s, leaving just the one I needed to test. Next I made sure my internet traffic was using this connection. Then I simply went to http://www.whatsmyip.org/ to confirm the transmit path IP. The receive path is easily tested using Telnet from external to the Public IP’s. we have similar issue where we are trying to connect with a federated partners meeting and get the same error which you have described. I feel confused while performing those steps but this issue is random. sometimes we are unable to join meeting and some times we are not able to join their video calls. I don’t understand why meetings with other partners are working fine. Could we have similar issue. I would say that you most likely have a network issue. My first thought is related to the subnets the users are connecting from. You need to collect the candidate information from the setup logs and map that out with your network architecture. That’s way you have a logical view of the routing involved.